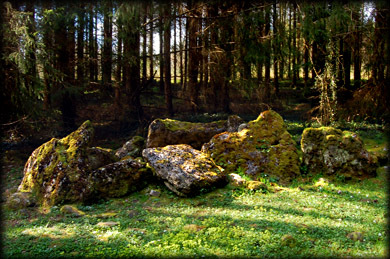 The court tomb at Gartnanoul is situated in a beautiful sylvan setting about sixty metres south of the road that winds through killykeen forest park. The monument is a dual court tomb set back to back with about 10 metres between the two chambers. The gallery of the southern tomb pictured below is about 5 metres long and as you can see from the image is divided into two chambers by a low jamb. The image above was taken from the southern court looking down through the chamber with the northern tomb in the background. Although very little remains of the actually structure Gartnanoul has a wonderful atmosphere to it and is well worth a visit. 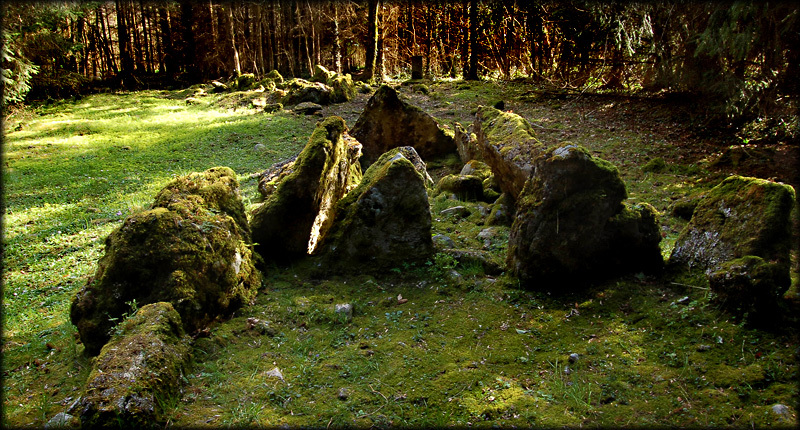 Situated: In Killykeen Forest Park about 2 miles west of Killashandra , County Cavan. From Killashandra take the R201 north for about two kilometres, just after a sharp left and right turn you will come to a fork in the road take the left fork signposted Killykeen forest park. Drive down this road into the forest, approximately 400 metres down this road is a small lay by on your right with a Coillte sign, the tomb is in a clearing sixty metres south of here. Discovery Map 34: H 3333 0698. Last visit April 2007.